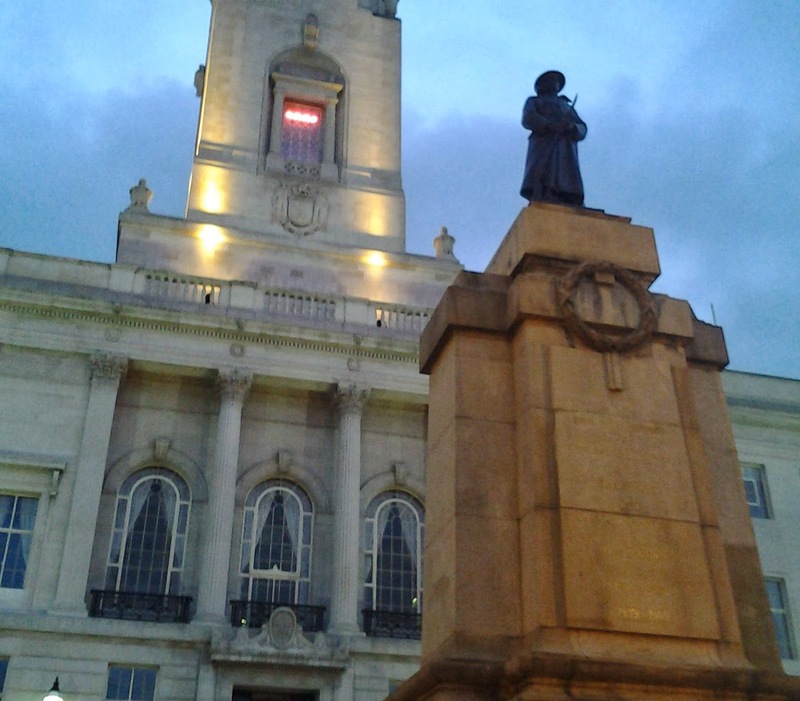 The third meeting of the Barnsley War Memorials Project will be held on Tuesday 6 May 2014 from 2pm to 3pm in meeting room 10 of Barnsley Town Hall. The Barnsley War Memorials Project's initial aim is to produce a Roll of Honour of the Fallen of the First World War for the Barnsley area. Further information can be found here. Items to be covered on 6 May include the new constitution, funding bids, progress, our public profile and accuracy and checking of work. All are welcome, but please contact us first if you can so that we know how many people to expect. Supporting papers can be requested from the same contact. In Memory of the Men We Loved Who Died for England 1914-1918 Requiescant in Pace. 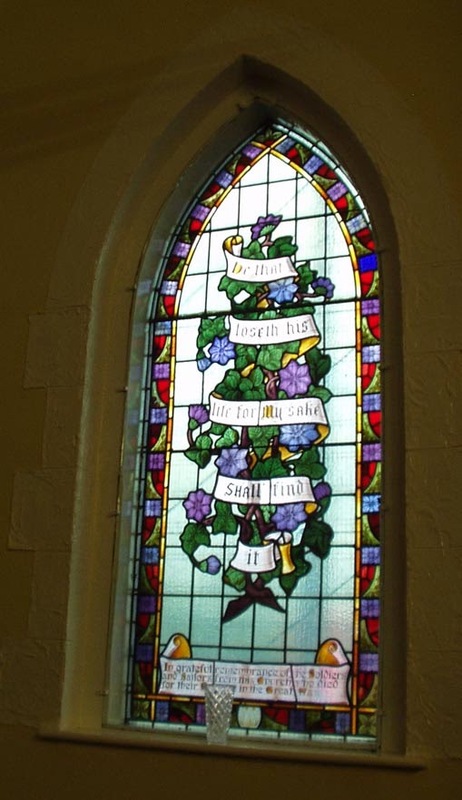 There are no names on this window, however the list of 82 names referred to in the cutting below can be found on our entry for the Memorial Plaque in St Helen's Church. 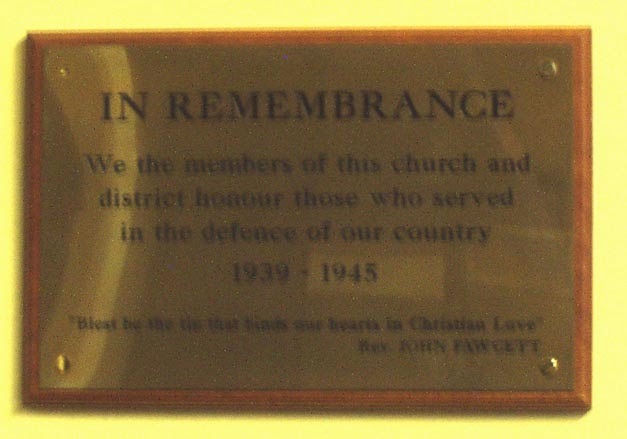 Thanks to the Rev David Hall for permission to photograph this tablet. We assume this tablet is from St Paul's Methodist church which used to be on the site of St Andrew's. If anyone can confirm this please get in touch. During both the First and Second World Wars re-repatriation of the bodies of fallen servicemen and women was not usual. The Unknown Soldier, entombed in Westminster Abbey represents those buried and commemorated overseas who could not come home. 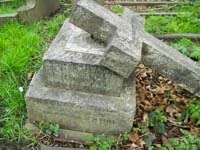 For many families, deprived of a graveside at which to mourn, one solution was to add the name of their lost son (or daughter) to the family gravestone in their local churchyard. The Imperial War Museum's War Memorials' Archive defines a War Memorial as "any tangible object which has been erected or dedicated to commemorate those killed as a result of war, conflict or peacekeeping; who served in war or conflict; or who died whilst engaged in military service." This includes gravestones which commemorate a casualty buried elsewhere. There must be a clear statement on the memorial (or in a printed document such as a newspaper report from the time) that defines the commemorative purpose of the feature and reports its erection. The full wording of their definition can be found here. Thus gravestones which include wording such as: died of wounds received in action, killed in action, fell in France, died on active service, reported missing in action, or even killed accidentally while on active service all count as War Memorials. 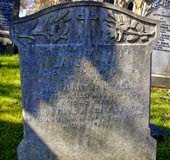 The wording is a "clear statement" that the purpose of recording that person's name on the gravestone is as a memorial. 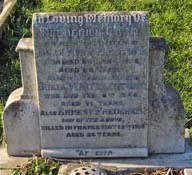 Graves which are situated on the site of the burial of a casualty, such as Commonwealth War Graves, are not War Memorials, however the Barnsley War Memorials Project is also collecting their details for inclusion in the Barnsley Roll of Honour. Carlton Cemetery contains two Commonwealth War Graves. In the list below, where the name is blue click to follow the link to a page with a larger photograph and more information. Darton War Memorial is unusual in that it is inscribed with no names of the fallen men of the area. We have found a list of men that the church warden thought should have been on the memorial and are searching the churchyard and cemetery for any more clues. 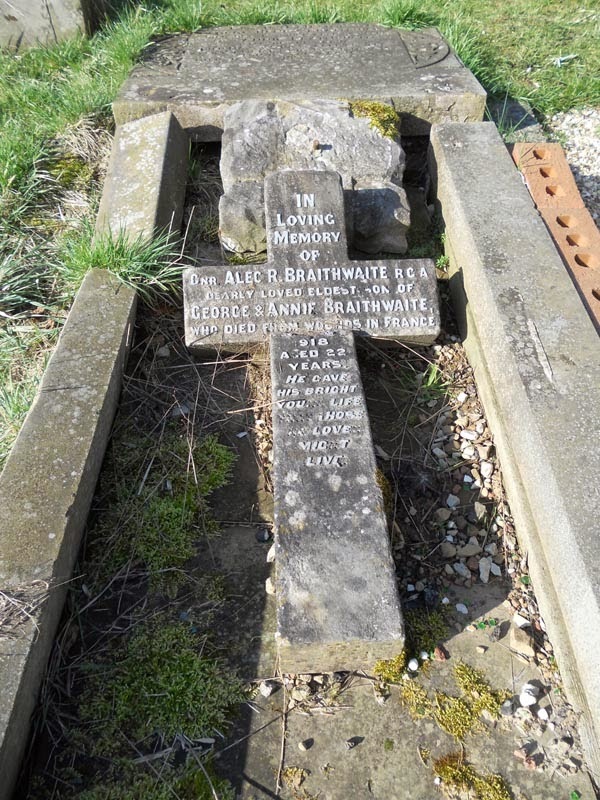 Alec Roy Braithwaite is buried in St Marie Cemetery, Le Havre, France. 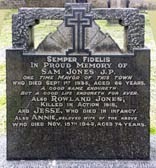 He is also remembered on the list of fallen men in the History of All Saints Church, Darton. 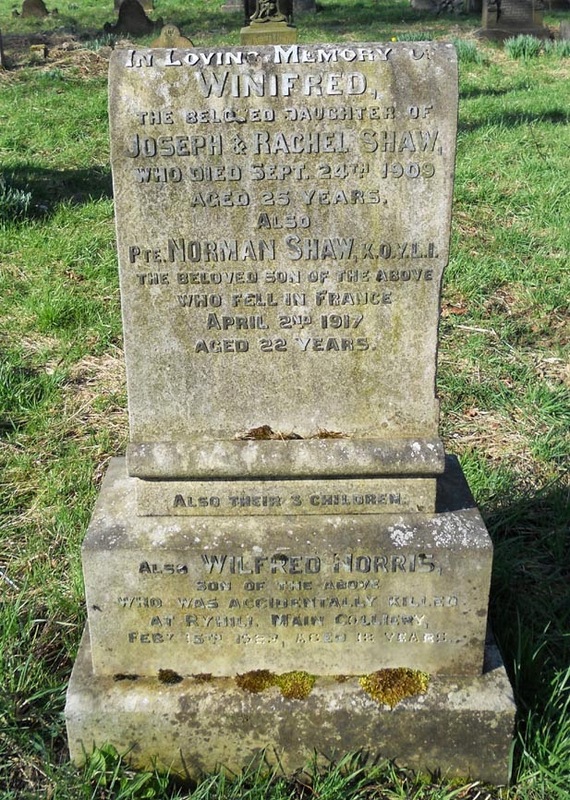 Norman Shaw is buried in France in the Merville Communal Cemetery. There are 20 CWGC graves in Monk Bretton Cemetery. 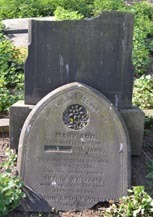 Barnsley Family History Society started transcribing the memorial inscriptions in Monk Bretton cemetery a few years ago however they have not published them all yet. 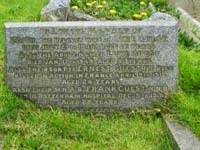 A computer disk of inscriptions and memorials in the churchyard and church is available to buy. They should be able to provide information on the memorials in the cemetery by request to their Searches Officer. 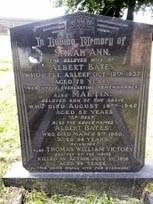 We are grateful to the Barnsley Family History Society for providing a list of the memorial gravestones and their inscriptions for this cemetery. Section A No.222, which is on the right as you walk down the path from gate. The stone is right at the back of the section near the boundary wall. Born September 20th 1844, Died August 17th 1895. February 4th 1909, aged 31 years. June 3rd 1918, aged 35 years. 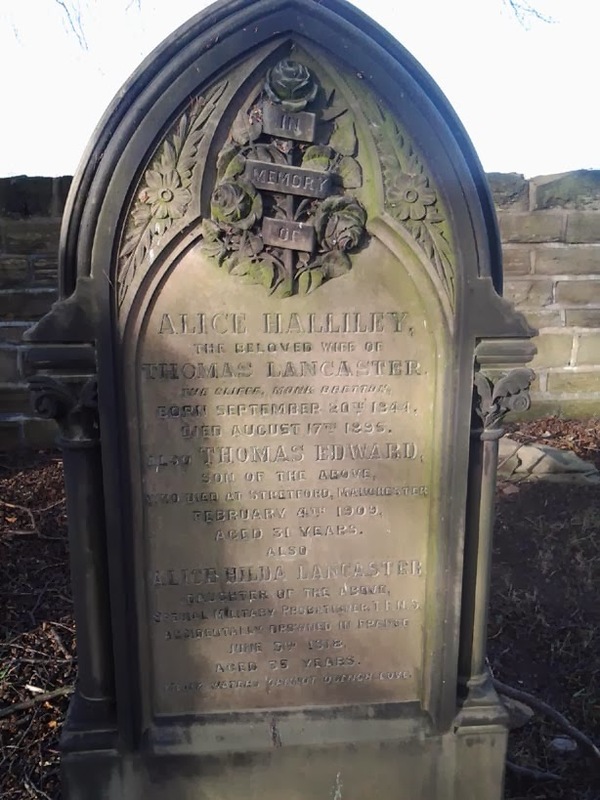 Read more about Alice Hilda on Barnsley Soldiers Remembered and here on a blog post which contains more information about the circumstances of her death. Photograph by BarnsleyHistorian and taken in 2010. Section H, No.98 which is on the left as you walk down the path from the cemetery gate. Look for the little markers on the edges of the sections. and here in a blog post about him. 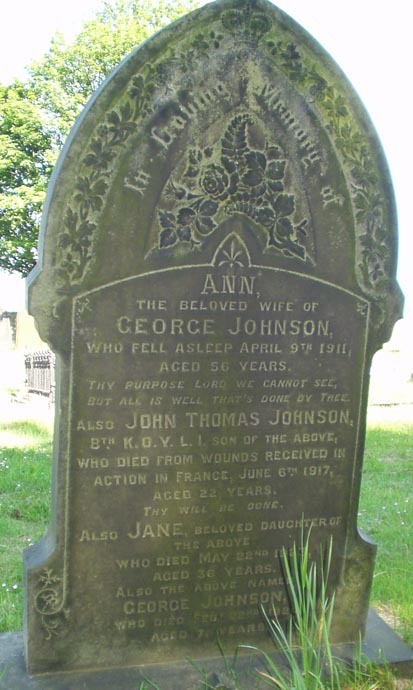 John is also remembered on the Monk Bretton, War Memorial, Cross Street, Monk Bretton and the Monk Bretton, St Paul's Church, WW1 Memorial Tablet and in the Monk Bretton, St Paul's Church, WW1 Memorial Book. He is buried at Lijssenthoek Military Cemetery in Belgium and commemorated on the Commonwealth War Graves Commission website. There are no names on this memorial. In grateful remembrance of the Soldiers and Sailors from this Church who died for their Country in the Great War. The other windows in the Church commemorate various local people and the Rev William Clough, pastor at the Church from 1891 to 1916. 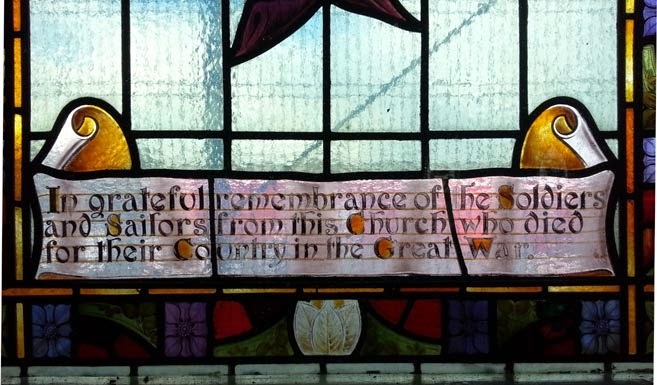 For a newspaper report referring to the dedication of these windows follow the link to the Stairfoot, Wesleyan Reform Church, WW1 Roll of Honour page. 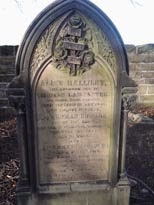 This grave is in the section of the church yard across the road from Holy Trinity Church, Elsecar. It is roughly straight ahead almost to the far wall as you enter the gate and then turn right. 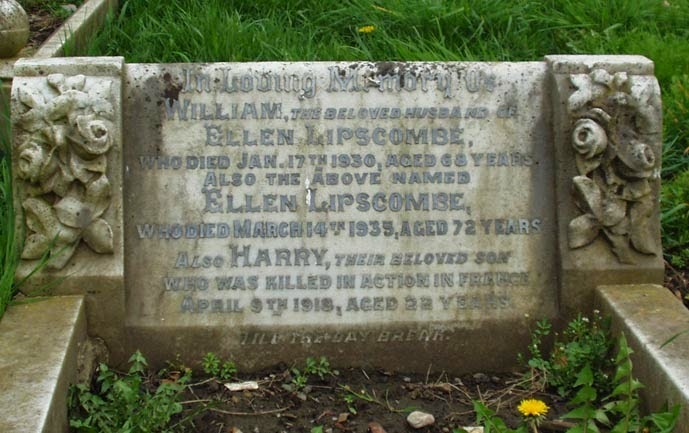 In Loving Memory of / William the Beloved Husband of Ellen Lipscombe, / Who died Jan 17th 1930 , aged 68 years / Also the above name Ellen Lipscombe / Who died March 14th 1935, aged 72 years / Also Harry, their beloved son / Who was Killed in Action in France / April 9th 1918, aged 22 years / Till the Day Break. on the Hoyland War Memorial and on the Barnsley British Co-operative Memorial Tablet. Harry is buried in the Pont-du-Hem Military Cemetery, La Gorgue, in France and is commemorated on the Commonwealth War Graves Commission website. This gravestone is at the bottom of the old churchyard near the wall separating it from Wath Road. 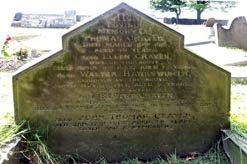 Louis was born in Elsecar, but he, his parents and siblings were living at 83 the Common, in Ecclesfield in 1911 - it is possible he is also remembered on a memorial in that area. He is buried in the Pink Farm Cemetery in Helles, Turkey and remembered on the Commonwealth War Graves Commission website. 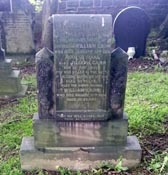 This gravestone can be found in Elsecar Cemetery, behind the church. In Loving Memory of / Edith the Beloved Wife of Luke Guest / Died July 27th 1940 Aged 65 years / Also the Above Named Luke Guest / Died Jan 17th 1949 Aged 81 years / Also their son Pte Ernest Guest N.F. Regt / Killed in Action in France April 9th 1917 / Also their son A.B. Frank Guest RND / Died in Rotterdam Hospital Dec 5th 1918 / Aged 22 years / In God's Keeping. 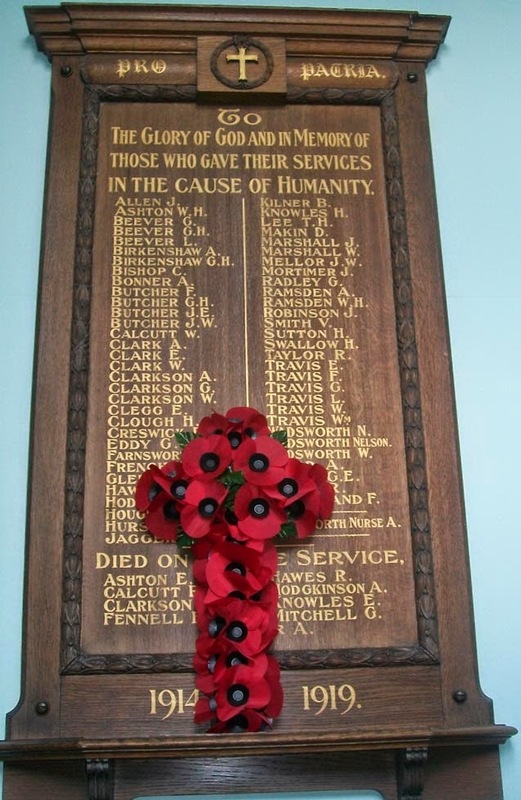 Ernest and Frank are also remembered on the WW1 plaque in Elsecar Holy Trinity Church, and the Jump and Hemingfield War Memorial. 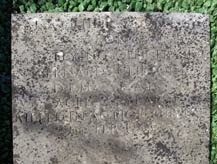 Ernest is buried in the Bailleul Road East Cemetery, St Laurent-Blangy, in France and is commemorated on the Commonwealth War Graves Commission website. Frank is buried in the Amersfoort General Cemetery in the Netherlands and is remembered on the Commonwealth War Graves Commission website. The burial ground at Elsecar is separated into the Old Churchyard - which adjacent to the Holy Trinity church, the New Churchyard - which is over the road in a separate area and the Cemetery which is behind the church - go to the east end of the Old Churchyard and look for the gate. Local history and Church records including Monumental Inscriptions, in many cases taken before the stones fell or were lost, can be accessed in Holy Trinity Church on Mondays between 10.30am and 2.30pm when volunteers will be present to help you plus teas and coffees are available. More information here. There are two Commonwealth War Graves at Elsecar, one in the New Churchyard and one in the Cemetery. Further information and usually a larger photograph have been provided where the name is coloured blue, click to follow the link.